The ACT Government's attempts to coax Parliamentary Triangle public servants on to ACTION buses have failed, according to the National Capital Authority. Results of a study carried out by the authority of commuting habits in the Triangle found the number of federal bureaucrats taking the bus to work in the area had fallen since 2006. The NCA study which says the triangle is being turned into a commuter car park, mostly for public servants, said the study also looked into the number of people taking the bus to work in the area. The study was conducted by research group Datacol for the NCA late last year and early this year and looked at commuter movements in Barton, Parkes, Capital Hill, Parkes North and Russell. In the Capital Hill area, the researchers found just 67 people arriving by bus in a five-hour period. In Parkes, a mere 427 bus passengers were observed in the five-hour study period. The NCA report noted that ''modal share'' or bus use, was very low in the area, about 5 or 6 per cent. The Queanbeyan bus operator isn't integrated and you need a different ticket. Queanbeyan should just be brought into the ACT. Canberra review their network annually, like most good systems. Brisbane's last top to bottom review was 1999. Changes to Canberra's weekend ACTION bus timetables will come into force from Saturday. The interesting thing is that ACTION is even more heavily unionised than BT, to the point where it seriously impacts on their ability to deliver decent weekend services because of favourable industrial conditions - yet they seem to be able to get on with annual reforms to their system to keep it working. BT can run BUZ services at full headways even on Christmas Day but heaven forfend if you want to reroute one. I'm told that the sky will fall and the earth open and swallow us whole if a Brisbane bus passenger ever gets out of their seat and, heaven forbid, waddles over to the railway station and catches a train. Canberra's bus drivers will arrive at work at 5am on Tuesday to the news that ACTION and Capital Metro will be rolled into a new public transport agency next year. The move comes as the ACT government prepares to ask for funding contributions from the federal government and Canberra Airport for their plan to build about 90 kilometres of light rail lines around Canberra over 25 years. Chief Minister Andrew Barr will meet Prime Minister Malcolm Turnbull next month, with funding for parliamentary triangle tram services high on his agenda after the federal government gave $95 million to the second stage of light rail on the Gold Coast. It is unclear whether the ACTION and Capital Metro brands will survive the change, with Mr Barr refusing to confirm the information on Monday. It is also unclear how the new agency would interface with the private consortium that will be chosen to build and operate the 12 kilometre Gungahlin line, with a decision on contracts due early next year. The change will allow the ACT government to combine ticketing for trams and buses and also help coordinate tram and bus routes – with a number of Gungahlin and Northbourne bus routes being scrapped when the tram begins operating in 2019 or 2020. A spokesman said only that transport was a priority for the government under Mr Barr. "To manage Canberra's growth, reduce congestion and protect liveability, we need to improve our public transport system," the spokesman said. It is understood the news will go first to drivers as they begin their shift. ACTION has about 850 staff, including 672 bus drivers, 410 of them full time. The government has struggled with ongoing budget problems at ACTION, and earlier this year Mr Barr demanded reform under threat of selling the network. The buses cost the territory budget $107 million in 2014-15 in government grants, up $4 million on the year before. Despite the cash, ACTION still didn't come in on budget, with an operating loss of $11 million. It commissioned a review by Brisbane transport consultants in the face of spiralling costs, but this has not been released. A combined agency presumably ensures ACTION remains in public hands. The taxi industry faces its biggest shake-up this week when Uber begins taking passengers from midnight on Friday. About 200 Uber drivers have already passed police and car checks. The newly released light rail master plan had all sides of politics animated on Monday, and the second stage could become the subject of election promises in 2016. The seven-line, 25-year proposal prioritises Parliament, Woden, Fyshwick and Canberra Airport. Public consultation will continue until December. "This is seriously on the federal government's agenda, so we will engage seriously with them, particularly in relation to areas where the federal government is a major employer and where their staff would benefit significantly from transport improvements," Mr Barr said. "We will also want to talk to Canberra Airport around options to extend into the airport precinct as well." Mr Barr would not say how much external funding the government would seek for light rail. "The ACT government, over two or three decades, clearly can make progressive additions to the light rail network like governments over the past 25 years have made additions to Canberra's road network," he said. Capital Metro Minister Simon Corbell​ refused to say how much the 3.2 kilometre Russell extension would cost. The government has given strong signals it will extend stage one to the Defence precinct. Greens Minister Shane Rattenbury said his party would run at the election on its record of securing light rail stage one, but that it was too soon to say if a future stage tram line would be a condition in any new Greens' governance agreement with Labor after 2016. Opposition transport spokesman Alistair Coe said the government had engaged in "back of the napkin" planning for a city-wide tram network. "We have to be very careful about entering into these discussions and creating false expectations, because the reality is Canberra simply can't afford it," Mr Coe said. Of course it made a loss. Canberra is set up for PT to be expensive with slow, winding streets and low density. I think some of the patronage increases with Light Rail are not entirely due to light rail installation but forced bus network reorganisation that happens concurrently with LRT opening. ACTION is also spectacularly expensive and poorly administered for what it is. Also carries fewer passengers than Surfside does with a fleet 50% larger. I can't find it in writing but it appears all-door boarding and prepaid services are going to happen in some form. New fares for travel on ACTION buses will come into effect on Saturday 2 January 2016. MyWay fares for ACTION buses will increase by up to 2.5 percent with cash fares increasing between 10 and 20 cents. The Liberals have announced plans for a complete overhaul of Canberra's bus network, promising six new express lines, a simplified timetable and routes designed to mirror commuter driving patterns. Providing a $20 million boost to the ACTION operating budget, an incoming Liberal government would create a Tuggeranong to Canberra Airport bus route, link Canberra and Calvary hospitals with express services and increase weekend and summer service frequency. 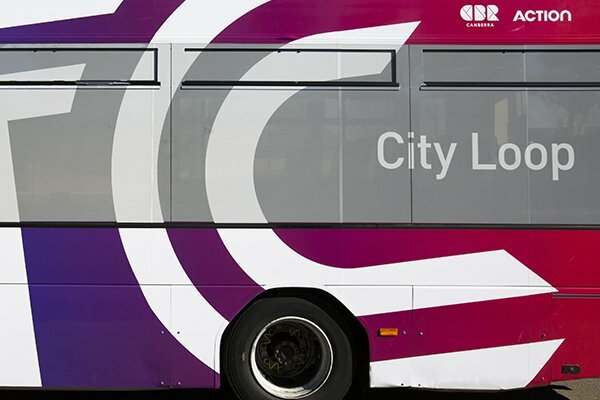 Daily passengers would be rewarded with free travel after eight paid journeys as part of a "Friday free" plan adapted from Brisbane, more cashless routes would be created in peak periods and new buses would have colour coding and improved signage on rapid lines. Very frequent routes would run every seven minutes on weekdays from Tuggeranong to Belconnen and Gungahlin to Fyshwick. At weekends and nights, the lines would run every 15 minutes. Weekday 10-minute services would run from West Belconnen to the city, Tuggeranong to the airport, Tuggeranong to the city, Gungahlin to Belconnen, Woden to North Canberra, Woden to the city. A new Parkway Express would run from Woden to Belconnen. Outside peaks, these services would run about every 20 minutes. Bus route numbers would operate across a 7 day timetable and late night services would run until about 1am on Thursday, Friday and Saturday nights. New four-door articulated buses would be added to the fleet to increase capacity and a $2 million trial of electric buses would be launched. A Liberal government would build a new depot, possibly adapting plans for a tram facility to be built at Mitchell. A separate annual $75,000 technology and innovation fund would also be established for future improvements. The party has already committed to adding 50 new buses and hiring additional drivers. Opposition Leader Jeremy Hanson and transport spokesman Alistair Coe will release the public transport policy on Thursday, the Liberals answer to the government's 25 year plans to build a city-wide tram network. The opposition has pledged to tear up contracts for the government's city to Gungahlin light rail stage one and say they will make further announcements about Northbourne Avenue before the October election. Last week the government shelved plans to extend tram services to Russell. No patronage targets or firm timeline is attached the opposition policy, but Mr Coe said many of the changes would be in place within a year of a Liberal government coming to power at the October election. ACTION's budget would grow to about $160 million under the plan, including revenue diverted from the Capital Metro Agency. Mr Coe said a Liberal government would not privatise ACTION, despite a 2015 report by transport consulting firm MRCagney saying a sale would save taxpayers as much as $47 million each year. Labor also ruled out privatisation, a move which would likely see opposition from transport unions. "We think just selling off ACTION is a cop out. We think there are far, far better ways to get results through increased performance and better patronage," Mr Coe said. The MyWay travel card could be made available for use in shops and other services, while the plan would also see bus priority measures added to some intersections and new infrastructure built at Manuka Oval and Canberra stadium to boost public transport use. A full audit of Canberra's bus stops is also included in the plan. ACTION could be returned to a stand alone agency, replacing the government's Transport Canberra agency which will begin operating in July. "What we're announcing is, we think, the most significant reform of public transport in Canberra ever released by an opposition or indeed by a government," Mr Coe said. "What we're announcing is a new network, which is going to build on the best aspect of the rapid bus network and expand it to serve a considerable section of Canberra's population." Mr Coe said better planning of buses for major events would be a feature of a new system. More performance data would be published, including some in real time.
" Daily passengers would be rewarded with free travel after eight paid journeys as part of a "Friday free" plan adapted from Brisbane .. "
Blue Team (9-then waste, free on friday afternoon) and Red Team (fare free friday) have converged on the same policy. After destroying the bus network, they want to discount it into oblivion by destroying the fare box. When politicians set the agenda for public transport it turns out as a great big mess! The Liberals' plan for new rapid bus routes is a logical start, with more direct routes being cheaper to run and better patronised, leading public transport consultant Barry Watkins says. But Mr Watkins, regional manager for MR Cagney, a long-time consultant on Canberra's buses, said the hard work was yet to come – working out which of the six proposed fast routes would be viable and which suburban services would be reduced to pay for them. The Liberals unveiled their plans last week for six new rapid, direct bus routes, adding to the current two. Buses would run every 10 to 20 minutes on routes the Liberals said were drawn up by asking how people would drive. Mr Watkins said buses worked well when they competed with driving the car, so starting with the major driving routes was logical. The standard approach to devising a bus network was to determine high-capacity, high-frequency corridors for premium services. A good network had a hierarchy of more frequent and faster routes, with local routes feeding in. "A logical route is straight lines – what's the shortest line between major destinations. You do it from first principles, then work out how well each would work," he said. "It needs to compete with what you can do in your car – if it's significantly slower you're not going to have a good outcome." Mr Watkins said Canberra's buses cost between $4.50 and $5 a kilometre, plus overheads. Faster routes were slightly cheaper than the "coverage" routes, because one of the biggest costs was driver pay. For a cost-neutral route, the buses needed 70 passengers an hour on every bus, or 2.5 passengers per kilometre, which was more than five times what Canberra buses were attracting now. Mr Watkins said the idea of more rapid routes was "great, but they're going to cost money to operate". "It all comes down to funding. How much are you willing to pay for your public transport network?" The tough decisions came when governments had to end suburban services. Previous attempts to make indirect routes "straighter" had failed after push-back from the community. "It happens every time you design a bus route that there will be somebody who loses out. You're trying to build a better system for a whole city, at the cost of a few greatly inconvenienced people. They're the calls you have to make." The Liberals promise to retain every suburban route, although say services might change, with some buses running less frequently. Mr Watkins said bus routes could be faster, more direct, cheaper to run and better patronised if people were prepared to walk further, but closing stops caused community angst, with many people having valid reasons for not wanting to walk further. In reality, people would walk further for good quality buses or trams or trains. People would not walk far to a bus that ran once an hour because if they missed the bus there were no easy options. "People who use public transport every day don't necessarily mind whether it's a bus or light rail or heavy rail. They want to know they will get to work on time, and they want to have a comfortable and safe journey, and if they miss it, another will come in five minutes. If you provide a good service no matter what mode it is people will take it up." Some very good points made in this article .. Speaking at the launch in Canberra, iiNet Chief Business Officer, Greg Bader, said that the free public wireless network was a globally significant project. "We believe that free Wi-Fi access is a critical part of the infrastructure of modern cities," he said. "Increasingly, cities across the world are building public wireless networks, with the most successful providing simple and free access for anyone. 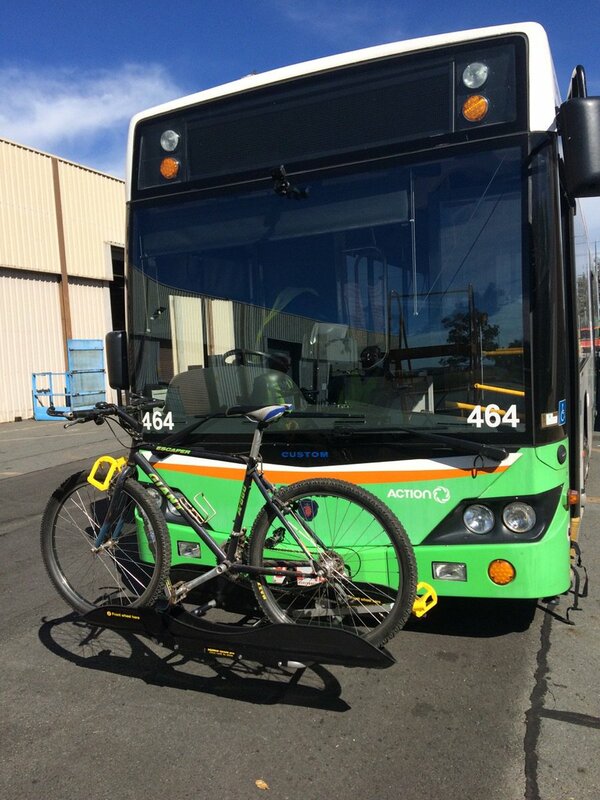 Today we're testing the use of bike racks on our larger buses as we work to increase options for bike & bus travel. iiNet is now owned by TPG, so I doubt that will happen now. The ACT Labor Government has revealed its plan to extend Canberra's rapid bus network, nearly five months after the Opposition announced theirs. 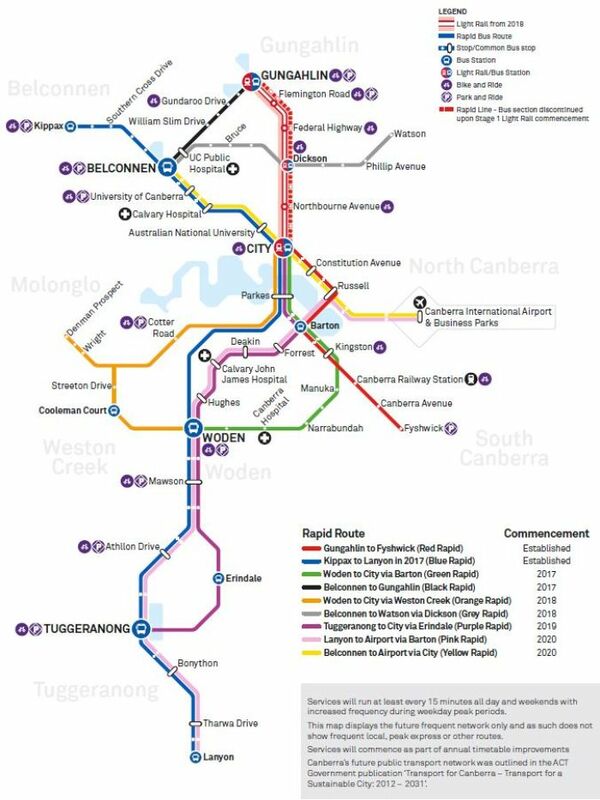 The policy adds seven new lines to the existing Blue and Red Rapid services, travelling through areas including Woden, Weston Creek and Canberra Airport. Those lines would be serviced every six minutes during peak times and every 15 minutes at other times. "When people know that there's always going to public transport where they need it ... that really drives patronage," Transport Minister Meegan Fitzharris said. "That's exactly what these rapid bus services already do and what future rapid bus services will do." The plan has been billed as a Government announcement rather than an election commitment, with funding to be allocated in the pre-election budget update. Labor's plan follows the Liberals' commitment in March to establish an eight-line Rapid network, which Ms Fitzharris criticised at the time for lacking detail. "There is a clear timeframe and cost for [this plan]," she said. Ms Fitzharris said the expansion of the network would be staggered, with lines from Belconnen to Gungahlin and Woden to the City coming online next year. "That really opens up the inner south suburbs, particularly through Narrabundah and Manuka into the city," she said. The policy sets aside $55 million for the services themselves and 100 new jobs, with an extra $51 million for 80 new buses and the design of a new northside depot. "This is a clear, costed plan where people know when they'll get their new Rapid services," Ms Fitzharris said. The first of 20 new, blue ACTION buses will hit Canberra roads next month as the ACT government expands its free off-peak travel service for senior and concession card holders. The blue buses will contrast with the first trams, which the government revealed will be red. The new ACTION fleet will be rolled out in 2017, with the first bus to hit the road in January. "This is a new model, a much more sustainable model, a much more comfortable bus, much safer for the drivers as well as the passengers," Transport minister Meegan Fitzharris said. he government will buy 80 new buses over the next four years as it expands the ACT bus network. "Labor made commitments for new bus services, new rapid services, two of them starting next year one from Belconnen to Gungahlin and the other from Woden to the city and we'll be adding more rapid services over the coming years," Ms Fitzharris said. "That'll require buying new buses over the course of the next term of government so we can continue to have a fleet that's sustainable." Passengers along new rapid ACTION bus routes will receive a free two-month trial, she said. Seniors and concession card holders will be able to travel for free on ACTION buses between 9am and 4.30pm and after 6pm Monday to Friday, and all weekend, in an expansion of their election commitment. 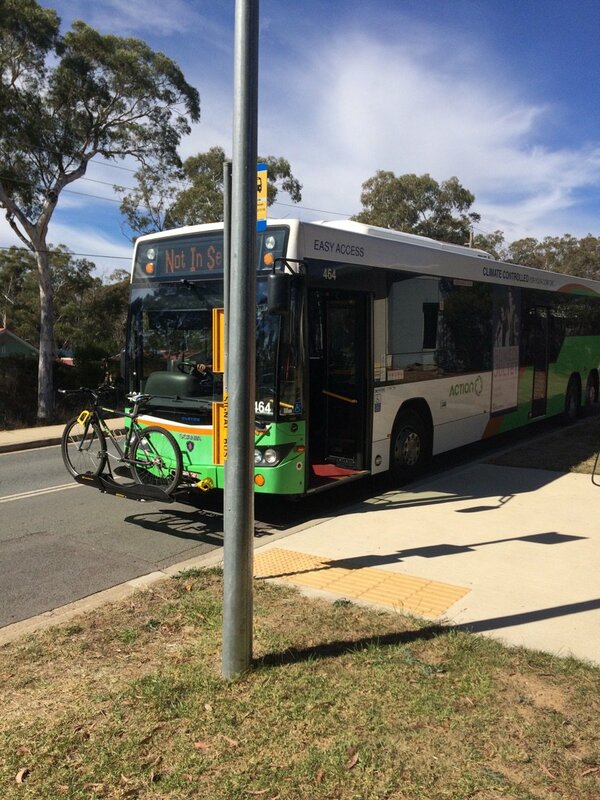 In the year to July, ACTION had 415 buses in service, including 303 wheelchair accessible buses and 356 buses fitted with bike racks. Transport Canberra deputy director-general Duncan Edghill​ said the new buses would seat two extra people and complement the three electric buses hitting Canberra roads next year. "The new buses will seat additional people, make for a smoother ride for our customers, it has additional hand holders, the heating system is improved and the new buses have a disability component," Mr Edghill said. The existing network of orange buses will be phased out as the new fleet comes on line, he said. "Some of the orange buses are nearing the end of their useful life. Some of them are between 15 and 20 years old and the average life of a bus is between the 20 and 25 year mark so you'll begin to see the phasing out of those buses. Those buses are typically disposed of or used in other networks in Australia," he said. The new bus attracted a lot of attention while parked outside Civic Square on Thursday. Bus enthusiast Brock Ginman​, 18, travelled especially to see it after a tip-off from a mate. "I'm a bus enthusiast. I've been fascinated by buses since I was three," Mr Ginman said, as he photographed it. The main driver and manager of Canberra Airport's express shuttle bus says he had no idea the ACT government would soon be introducing public transport to the terminal. The Canberra Times broke the news to David Wischer on Thursday afternoon after Transport Minister Meegan Fitzharris revealed the new service in a Legislative Assembly committee. Ms Fitzharris said public buses would begin running to the airport on March 20. The route 11 bus will have 32 city-airport services each way on weekdays from 6.26am to 9.11pm. Return trips will run from 6.48am to 9.40pm. The bus will run 13 times on Saturday and 12 times on Sunday and public holidays. The private shuttle operates 12 times each way on weekdays and 10 times on weekends. Currently on holiday in Melbourne, Mr Wischer, who runs the express shuttle operated by Royale, said he was "gobsmacked" to hear the news. A phone call to Royale also found the receptionist was unaware. Asked if the express bus would continue after March 20, Mr Wischer said "it's dead in the water", although it could possibly be reconfigured as a hotel transfer service. "I'm shocked and dismayed," he said, adding that three jobs could be lost. Mr Wischer said the express shuttle had struggled with a lack of signage at the airport. "Uber has got a sign and we don't," he said. The committee this morning heard signs will be installed at the terminal to inform arriving passengers of public transport and the bus will stop close to the main entrance. Timetables show the journey taking 15 to 19 minutes, slightly faster than the shuttle, which stops at the YHA and National Convention Centre. "The government doesn't even realise we exist, I think," Mr Wischer said. "There's been no warning at all. I've heard people on radio saying 'why isn't there a public bus service to the airport?'. "Well there is; we cost $12 and we give a really good service." Public transport advocates however, have welcomed the introduction of government buses. "It has been one of the great mysteries of Canberra why there has not been public transport to and from the Canberra Airport terminal," David Johnston said. "Some bus services currently go tantalisingly close to the airport, but still leave a good walk for public transport users. "Most cities have had public transport to their airports for many years now and these services are in the main well patronised, as I am sure the new service here will be." Mr Johnston said modifying route 11 was a good choice. "The timetable also looks good for a new service and I am pleased to see that MyWay and standard fares will apply," he said. "It is also good that the new service will have wheelchair access for the disabled. This has been a big gap with the existing private shuttle." Mr Johnston said more improvements to the wider network were needed. "It's great to be able to commence this new bus service so people have another option about how they travel to and from Canberra Airport," Ms Fitzharris said in a statement. "Customers will be able to take public transport from the city to the Canberra Airport, with services running about every half hour, better during peak times on weekdays, and every hour on weekends. "Canberra Airport plays an important role in our city's economy, and this service is being implemented following talks with the Canberra Airport and feedback from the community." The government had previously committed to introduce the airport service by 2020. "It's great we have been able to introduce a public transport link to the airport early, and this service will operate until such a time that a Rapid Bus to Canberra Airport is introduced," Ms Fitzharris said. "This is another example of the ACT Government's commitment to providing accessible and attractive public transport options for the ACT." Canberra Airport also welcomed the government's move. "This will increase the transport offering for airport passengers, in addition to taxi services and Uber ride sharing," managing director Stephen Byron said. "Airport passengers have been well serviced by the Airport Express shuttle service run by Royale since September 2011. "Royale has been very generous in providing this service, and we express our gratitude to them for complementing the airport's transport offerings. "The decision by Transport Canberra will be particularly welcomed by our low-cost carrier passengers, who will be well serviced for departures and arrivals." It's great news for passengers but terrible news for the bus small business owner, who the gov't has just bankrupted at a moment's notice. The right way to go about this would be to call for tenders for an airport service provider, and/or charge an access fee that reflects true costs to get to the airport. Why? ACTION already runs a bus there, it now just goes to the terminal. Private business shouldn't be a protected species. Should the government have compensated Coachtrans when the Gold Coast line opened? The Supreme Court didn't think so. Err... it is not about protection. There are rules. For your next trick, perhaps you could enlighten us as to what role the Productivity Commission has to play here instead of quoting something from their website of zero relevance. Err... not irrelevant, was just demonstrating the principles generally. PC just happens to have a succinct explanation about it. Part of national competition policy. ACT has their own regulator. All states and territories have agreed to this. No need to be gripey about it. by virtue of their public sector ownership. of the suite of agreements commonly called the National Competition Policy. Would be interesting to see what the outcome is. Complaints in the ACT have focussed on matters such as public swimming and fitness facilities, and the government-owned linen service. Elsewhere, complaints have ranged across a number of issues, from public facilities such as pools owned by municipal councils, to child care facilities and cemeteries.